Selected as one of Motley Fool’s "5 Great Books You Should Read"
In The AIG Story, the company's long-term CEO Hank Greenberg (1967 to 2005) and GW professor and corporate governance expert Lawrence Cunningham chronicle the origins of the company and its relentless pioneering of open markets everywhere in the world. They regale readers with riveting vignettes of how AIG grew from a modest group of insurance enterprises in 1970 to the largest insurance company in world history. They help us understand AIG's distinctive entrepreneurial culture and how its outstanding employees worldwide helped pave the road to globalization. 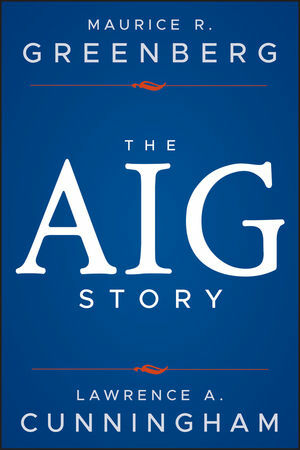 Corrects numerous common misconceptions about AIG that arose due to its role at the center of the financial crisis of 2008. The AIG Story captures an impressive saga in business history--one of innovation, vision and leadership at a company that was nearly--destroyed with a few strokes of governmental pens. The AIG Story carries important lessons and implications for the U.S., especially its role in international affairs, its approach to business, its legal system and its handling of financial crises. MAURICE R. GREENBERG is Chairman and CEO of C.V. Starr & Co., Inc. He joined C.V. Starr & Co., Inc. as Vice President in 1960 and was given the additional responsibilities of President of American Home Assurance Company in 1962. He was elected Director of C.V. Starr & Co., Inc. in 1965, Chairman and CEO in 1968 and continues in that role. Mr. Greenberg retired as Chairman and CEO of American International Group, Inc. (AIG) in March 2005, after serving as Chief Executive Officer from 1967. Under his leadership, AIG became the largest insurance company in the world and generated unprecedented value for AIG shareholders. During the nearly forty years of his leadership, AIG's market value grew from $300 million to $l80 billion. LAWRENCE A. CUNNINGHAM is the Henry St. George Tucker III Research Professor at the George Washington University Law School and Director of GW's Center for Law, Economics and Finance (C-LEAF) in New York. Previous books include Contracts in the Real World: Stories of Popular Contracts and Why They Matter (Cambridge University Press 2012). His writingson a wide range of business and legal topicshave also appeared in leading scholarly journals and such periodicals as the New York Times, the Financial Times, and the New York Daily News.